I am a very, very sad book snob. Includes an impressive amount of books written by female authors, challenging the traditional male canon of capital-gee, capital-el Great Literature. Includes 45 works I’ve already read. it includes 45 books I’ve already read. Upon reflection, that’s … 4.5%, which is less than impressive. Good going, me! Despite these cons, Boxall’s list looks like a great way of brushing up on all those classics that fall through the cracks of your bookshelf as well as noticing the lesser-known older novels that contributed to the genre. The reviews, contributed by 100+ book critics, are compelling snapshots of the novels. It is unlikely that I will ever complete this list. However, if I’m going to make a New Year’s Resolution it is damn well going to be an impossible and pointlessly ambitious one. But, on the pro side, even if I read at the unlikely pace of 1 book per week, it will take me over eighteen years to read the 95.5% of the novels I haven’t read. Count ’em, that’s 18 years that I don’t have to make a new New Year’s Resolution. So really, it’s a labor-saving device. I, too, can believe 6 impossible things before breakfast. 1) One can enjoy a film for its own merits, and not simply because of its use of fancy new 3D technology. I’ll confess being a snob on this one, but from Avatar (my brother calls it Blue People) on, I have been unable to take 3D films seriously. 3D is a gimmick which distracts from the reason we truly enjoy cinema … you know, things like characters, umm plot… little stuff like that. 2) A story written with none of Lewis Carroll’s original wit and verve can still manage to be decently compelling. I’ll admit it: when I first read that this was not to be a remake but a continuation of Carroll’s work I had trepidations. Would this be the doomed threequel? the Matrix Revolutions of the Alice sagas? And although much of the dreamlike logic of the originals is lost, and it plays suspiciously like real life, my nightmares did not take shape. 3) The White Queen can be played as a “punk-rock vegan pacifist”. Quite simply: after Rachel Getting Married I believe in Anne Hathaway like some people believe in God. 4) Matt Lucas can surpass his performances in “Little Britain”. The first time I was shown this sketch, I thought, no way. This is it. This man is brilliant, and this is the perfect role. This is the pinnacle … of … of … of everything. And then he played Tweedledum. And at that, he also played Tweedledee. And I changed my mind. 5) Roger Ebert is fallible. Ebert’s review of the film ends with this complaint. Why does Alice In Wonderland have to end with an action sequence? Characters not rich enough? Story run out? Little minds, jazzed by sugar from the candy counter, might get too worked up without it? Or is it that executives, not trusting their artists and timid in the face of real stories, demand an action climax as insurance? Insurance of what? That the story will have a beginning and a middle but nothing so tedious as an ending? Sure, Rog, the action sequence was a bit overwrought. My friends and I even giggled when the Jabberwock’s head came — dare I say “gallumphing” ? — down, and down, and down the stairs. But I wouldn’t peg that as a real ending, but rather the foreshadowing of a second, real-life ending. After all, Alice is adamant the entire time that Wonderland isn’t real. The battle is symbolism of the most obvious order, a coming-of-age story in which Alice proves she is truly her father’s daughter. In that case, the business meeting in which Alice becomes not a daughter-in-law but a business partner to the pompously-named Lord Ascot is the real-life counterpart to her beheading of the Jabberwocky, and may perhaps be read as an alternate climax. A note: Ebert doesn’t really seem to be too picky about getting his minutia straight. In his review, he refers to a “wedding scene,” which, if you watch the film, is merely the most public proposal ever. This reminds me of his review of Marlowe, in which he refers to Bruce Lee as the “japanese karate expert.” Sure, these mistakes make very little narrative difference to the movie. But really? 6) Feminist fantasy films exist. I’m not saying it was perfect. The preponderance of “3D moments” where one is jerked out of the diegesis to notice, oh wow something was supposed to look as if it flew past my head there — pure annoyance. 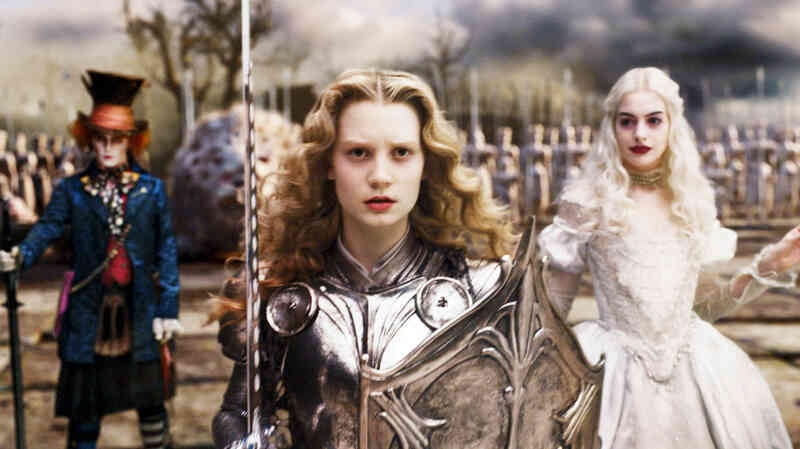 And, as few fantasy films can escape, Alice builds to a largely stereotypical end. It is testament to Burton’s skill that these elements didn’t kill the magic. On my part, I would have liked a little more of the Carroll-style dreamlike wandering, but, like childhood, all good things must come to an end, and Alice must grow up. It might be a repellant concept for Colin Farrell’s character in the film In Bruges, but it certainly makes for a wonderful movie. In the vein of “Lost In Translation”, the film similarly documents the escapades of two semi-awkward foreigners (in this case, British assassins) in a foreign city (Bruges, not Tokyo. I know, came out of the blue, that one). Farrell plays Ray, who obviously isn’t very enthusiastic about sightseeing (“Ken, I grew up in Dublin. I love Dublin. If I grew up on a farm, and was retarded, Bruges might impress me but I didn’t, so it doesn’t.”) Ken, played by Brendan Gleeson, takes the opposite view, indulging in all the sightseeing he can, and dragging Ray around with him. In Bruges is a feature-length film that views like a short, but with lots more stuff crammed in. As the film takes a turn for the violent, it becomes more of a Lost In Translation/Pulp Fiction hybrid, except with all white people and, of course, in Bruges. (Hope I’m not giving too much away.) During a pivotal chase/gunfight scene, I got the feeling that fully half of the camerawork was still meant to show off the beautiful scenery. Oh yes, and Ralph Fiennes swears. A LOT. Below is a list of the things I learned from this movie. Make sure to do cocaine with midgets… er, dwarves. Even though you’ve been warned that he’s been taking horse tranquilizers. Never assume the douchebag sitting next to you is American, and accidentally knock both him and his girlfriend out, regardless of whether or not she comes at you with a bottle or even knows karate. He’s probably a vengeful Canadian who will get you killed. Be a prostitute — you’ll make more than you did in Amsterdam. Make sure you know someone who you can buy horse tranquilizers from. They’re a good excuse not to greet people on the street. Except maybe horses. When under great stress, the dried blood of Jesus reliquefies. Don’t do anything in half-measures. If you’re going to blind a man by shooting blanks into his eye, at least do it to both eyes. As long as you can introduce it in a charming way, pretty girls are all right with dating hired killers. Also, if you moan a lot about how you never thought a “girl like her” would “actually be into” a “guy like you”, she’ll give you a kiss before she takes her half-blind ex-boyfriend/con partner to the hospital to get an eyepatch. Which will then give you an opportunity to steal drugs from her, which she won’t mind even though it’s high-grade cocaine and ecstasy. And possibly horse tranquilizers. It’s the beginning of spring semester, although I always feel a little weird referring to it as “spring semester” when it is still so very obviously winter. This semester I get to ditch nasty physics classes for some nicer ones, and although I am taking on a bit more difficult semester (18, maybe 19 credits) I think it will be more fun by virtue of the classes themselves. Over the break, I had a very short-lived Tumblr account, before a friend introduced me to soup.io. Mine, under augustine, has become where I’m filtering most of the stuff I look at on the internets, mostly design-, illustration- or architecture-related. The nicest thing about soup.io is that it includes built-in automatic feeds for most common and some less common Web applications (last.fm, vimeo, youtube, del.icio.us, vi.sualize.us, and flickr are the ones that I find the most useful.) Its interface is lovely, and it’s easy enough to post things directly to your soup. It’s nice to have everything I find in one place, with a search box for easy finding. I also did a wordle for this blog. The dominant themes aren’t all that surprising. I plan on writing a little more this semester, partly because I will be writing things like response papers for art history anyway and I thought perhaps I could subject the internet to my thoughts on the history of film as art, as punishment for all its sins and wrongdoings. In the meantime, I’ll be posting things to my soup. Elvis Costello once said that writing about music was like dancing about architecture. If that is the case, then what is music about architecture? Asthmatic Kitty Records’ compilation Habitat, a collection of experimental electronic music written around the theme of architectural space, answers that question with two discs of original music by a variety of artists, and an equally varied different takes on electronic music in general. I first read about Habitat on It’s Hard To Find A Friend. I was immediately sucked in by the idea of music written around and within architecture, and KO’d by the fact that proceeds went to Habitat For Humanity. And if that wasn’t enough, the power of the titles compelled me. Titles like “Your God Is A Lion Recently Fed, Drowsy” and “Utiliterranean“. Even “Staircase And Water Pipes, 42 Broadway“, which sounds more suited to a high-contrast black and white photograph than to a song, seduced me with its evocative loveliness. The CD shipped promptly, so much so that it surprised me in my mailbox (you know the feeling). The CD was a present from myself, arriving early and unexpected. Rushing upstairs, I popped the CD into my laptop and began to listen. The first track, entitled “A Cross Section Of Clown Mountain“, is partially the work of Asthmatic Kitty’s most famous son, Sufjan Stevens, whose work introduced me to the label. This, his collaboration with cofounder Lowell Brams and Bryce Dessner, The National’s guitarist (the three together under the moniker Tidal River) is a captivating opener, expansive, stately, and rather epic. On that night, not too long ago, the first CD had progressed to its third track, “Little Furnace” by Jim Guthrie, a mellow industrial track evoking the titular machine, which I imagine as a stationary Little Engine That Could. As I listen, I read the artist statements for each piece, each one only slightly less nebulous and impressionistic than the piece it’s meant to represent. “Little Furnace,” for example, is “combustion at the bottom of the sea onboard a tiny metal submarine. Each note competing with the one before it; reverberating heat in an otherwise cold abyss.” Sigh. Bliss. Meanwhile, my roommate, watching television in the living room, asks me, “What’s that noise?” I looked at her strangely. Oh, you mean that semirhythmic clanking in the other room? Just some ambient music I’m listening to, in case you didn’t find my musical taste strange enough. The tracks are almost wordless to a man, with a couple of exceptions. One of my favorite tracks, “A Long Way From Home” by Moth!Fight!, is one such, but the words are Dadaist, chaos-filled. “I flew … to the castle … which was the only way to get there … the only way was to fly,” a male voice declares before it devolves wonderfully into something that sounds like a schizophrenic blend of the Polyphonic Spree, Animal Collective and Clap Your Hands Say Yeah after three straight espresso shots. According to Moth!Fight!’s statement, the song revolves around creating the atmosphere of a new home. This isn’t a conclusion that can simply be pulled out of the music, which for the most part lacks revelatory lyrics. Like most of the tracks on the album, “A Long Way From Home” relies on the narrative power of sound to create a sense of the exploration of space and architecture. The tracks use the statement, only posted online (not part of the album booklet at all) in the absence of lyrics, to sharpen and pinpoint the reader/listener’s understanding. This leaves the tracks sounding something like architecture – without a specific narrative, but storytelling nonetheless. Definitely not for everybody, but I love. How does this even exist? Wow. I mean. Wow.